On March 15, 2015, JPI was proud to sponsor a screening and panel discussion of the history and treatment of cancer at the South Side Works Cinemas. 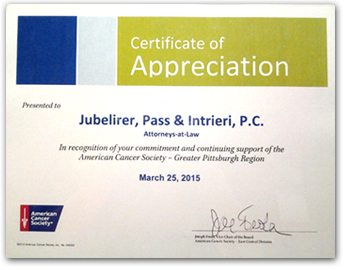 The event was in cooperation with the American Cancer Society Greater Pittsburgh Region and WQED. The screening was a short preview of an upcoming three part series on WQED entitled “The Emperor of all Maladies — A Biography of Cancer” produced by legendary filmmaker Ken Burns Airing on March 30, 31 and April 1. Following the screening was a panel discussion regarding all aspects and treatments of cancer by a distinguished panel of physicians from the western Pennsylvania area. We are proud to have had a part in this program along with the American Cancer Society Greater Pittsburgh Region and WQED. JPI attends the meetings of the Teamsters Joint Council 40 and the Allegheny County Labor Council and publishes reports from those meetings on our website.